Quick delivery, well packed and clear instructions. Thankyou. First class advice, service and delivery. Would definitely recommend this company to freinds and family. quality battery with an even better service, i got a bit of an awkward size battery, i end up ordering wrong one so tanya ltd picked it back up straight away and got the right one to me inside 48 hrs. excellent service, well done. Conforme au produit commandé, emballage soigné et livraison rapide.je repasserais par vous pour une autre prochaine commande. Running perfect. Plenty of Cold Crank. Well packaged and speedy delivery. 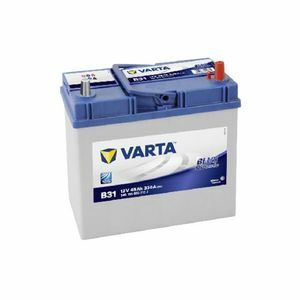 B31 Varta Blue Dynamic Car Battery 12V 45Ah Order to delivery by DPD less than 24 hours . Very well packed Was able to select Amp/Hour upgrade using the highly detailed info on webb site. Super fast service. Thank you guys. great product at a great price promptly dispatched, thankyou. DIFFICULT TO SOURCE BATTERY WITH JAPANESE POSTS WAS EXACT FIT FOR MY HONDA ELYSION. WORKS PERFECTLY. I needed a battery for my camper, ordered this Varta one from Tanya mid afternoon received it the next morning, product exacty as advertised. I found the Tanya web site easy to use with straight forward advice re; battery size, terminal, polarity, position and type. If the battery proves to be as good as the sevice (only had it 2 weeks) I'll be happy. Fitted perfect and doing the job.